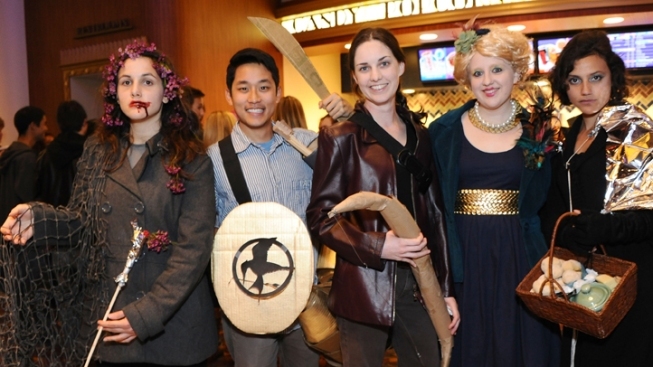 Fans dressed up as their favorite characters at "The Hunger Games" opening night midnight showing in Los Angeles. "The Hunger Games" has filled fan appetites with a $155 million opening weekend that puts it near the top of the domestic record book. The huge haul marks the third-best debut ever in terms of revenue, behind the $169.2 million opening for last year's "Harry Potter" finale and the $158.4 million opening of 2008's "The Dark Knight." "Harry Potter" and "Batman" were well-established franchises. "The Hunger Games" set a revenue record for a non-sequel, taking in more than twice what the first "Twilight" movie did with its $69.6 million opening weekend. "This is the birth of a franchise. To launch in this fashion is mindboggling," said David Spitz, head of distribution at Lionsgate, which now also owns the "Twilight" franchise after its purchase of Summit Entertainment. It also was by far the biggest start for a film opening outside the busy summer and holiday seasons. According to Sunday studio estimates, "The Hunger Games" came in nearly $40 million ahead of the previous March record-holder, 2010's "Alice in Wonderland" at $116.1 million. "The Hunger Games" slid into the No. 3 spot on the domestic revenue chart ahead of "Spider-Man 3," which opened with $151.1 million in 2007. Factoring in today's higher tickets prices, "The Hunger Games" sold fewer tickets over opening weekend than "Spider-Man 3," though. Fans camped out for the first screenings of "The Hunger Games," which began just after midnight Friday. Many fans showed up dressed as favorite characters from the story. "That type of behavior puts it on the level of the 'Star Treks' and 'Star Wars,'" Spitz said. "I was so excited to see how everyone was responding to the material and how ecstatic they were to be a part of it." With a broader fan base than the "Twilight" franchise, "The Hunger Games" pulled in bigger crowds than the top-grossing installment of that series. "The Twilight Saga: New Moon" leads that franchise with a $142.8 million opening weekend in 2009. Women and girls have made up as much as 80 percent of the audience for the "Twilight" flicks. Though it features a female lead, "The Hunger Games" drew more balanced crowds, with girls and women accounting for 61 percent of audiences, according to distributor Lionsgate. Despite its teen fan base, "The Hunger Games" also did well among older moviegoers. Fans 25 and older made up 56 percent of the crowds. "The Hunger Games" stars Jennifer Lawrence as a teen who is one of 24 youths forced to compete in a televised death match in a post-apocalyptic North American society. The film is based on the first novel in the best-selling trilogy by Suzanne Collins. Lionsgate plans to release part two, "Catching Fire," in November 2013, and hopes to do the finale, "Mockingjay," as a two-part film installment. "The Hunger Games" gave Hollywood a huge lift during a normally quiet time at theaters, with the start of the summer movie season still a month and a half away. Overall domestic revenues totaled $214 million, up 76 percent from the same weekend last year, when "Diary of a Wimpy Kid: Rodrick Rules" led with $23.8 million, according to box-office tracker Hollywood.com. Business has soared this year, with domestic receipts now at $2.4 billion, 19 percent ahead of last year's. Hollywood also has a potentially record-breaking summer lineup coming that includes the superhero tales "The Avengers," ''The Amazing Spider-Man" and "The Dark Knight Rises." "With this incredible weekend for 'The Hunger Games,' we're perhaps experiencing what could be called the perfect box-office year," said Hollywood.com analyst Paul Dergarabedian. "We're just on a trajectory like I've never seen." The previous No. 1 movie, Sony's action comedy "21 Jump Street," dropped to a distant No. 2 but held up well in its second weekend with $21.3 million. That raised its domestic total to $71.1 million. 1. "The Hunger Games," $155 million. 2. "21 Jump Street," $21.3 million ($5.3 million international). 3. "Dr. Seuss' the Lorax," $13.1 million ($5.5 million international). 4. "John Carter," $5 million ($22.2 million international). 5. "Act of Valor," $2.1 million. 6. "Project X," $2 million. 7. "A Thousand Words," $1.9 million. 8. "October Baby," $1.7 million. 9. "Safe House," $1.39 million ($2.3 million international). 10. "Journey 2: The Mysterious Island," $1.37 million.